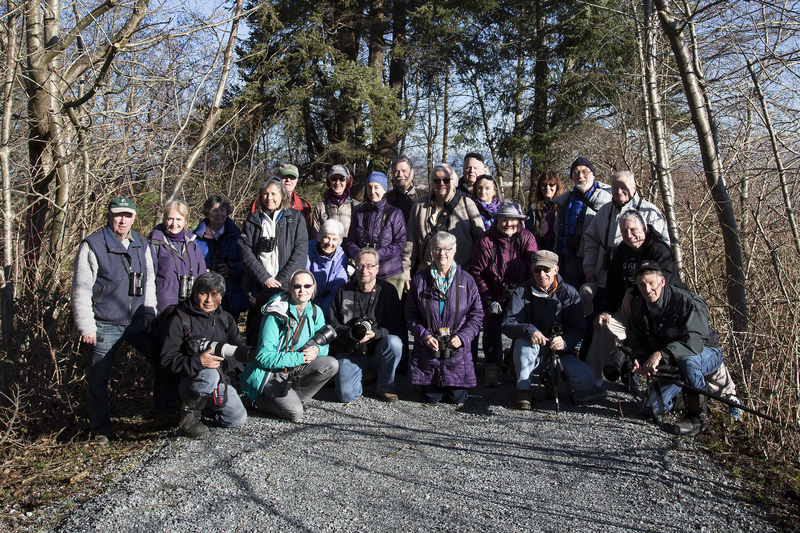 A huge crowd of 30 DNCBers enjoyed a beautiful, sunny and mild Tuesday morning of birding at our “Mecca”, the Alaksen National Wildlife Area (NWA) and Reifel Bird Sanctuary. We saw tonnes of species, many up-close-and-personal and in breeding plumage. Check out the photo evidence on our DNCB Picasa site. About 15 of us left Petra’s Kafe shortly after 8:00 a.m., car-pooling poorly through the Ladner fields to Westham Island. 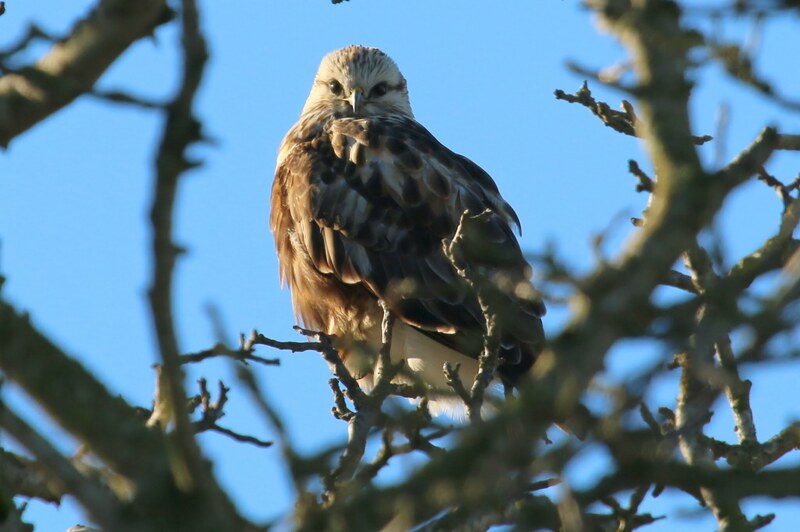 We stopped in the middle of the Tsawwassen First Nations huge construction development on 27B Ave. for Terry to photograph a posing Rough-legged Hawk, one of several seen on the day. Then we stopped again on 33A Ave. for a small flock of Black-bellied Plovers foraging in another field. 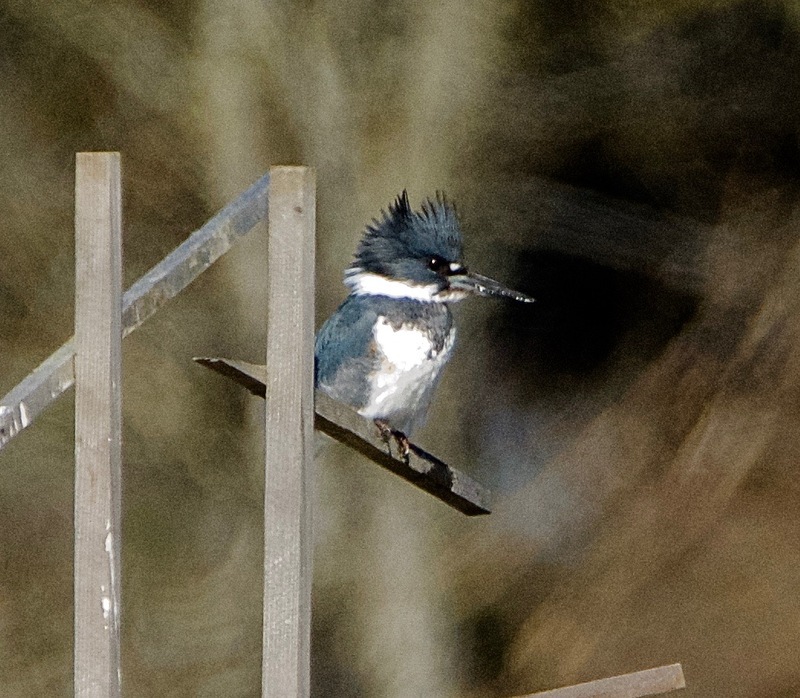 We didn’t stop for a Belted Kingfisher on the line near the Bridge, but we did see PB Lorna’s favourite species later posing on the Purple Martin Boxes at Reifel. Thus, as usual, we were 20 minutes late arriving at Alaksen to meet the smiling horde waiting for us. Following introductions, we started our walk from the legendary Cedar Tree Entrance to the Loop Trail. Lots of pellet evidence under the Cedars, but we couldn’t find any of the resident Barred Owls. The first slough had a Pied-billed Grebe and both Common and Hooded Mergansers. We got the third Merganser species, the Red-breasted, later in the Fraser River. Starting the Loop Trail, a Brown Creeper was climbing up a trunk (Interestingly, I learned that only 30% of “older folk” are able to hear this bird’s high pitched song). 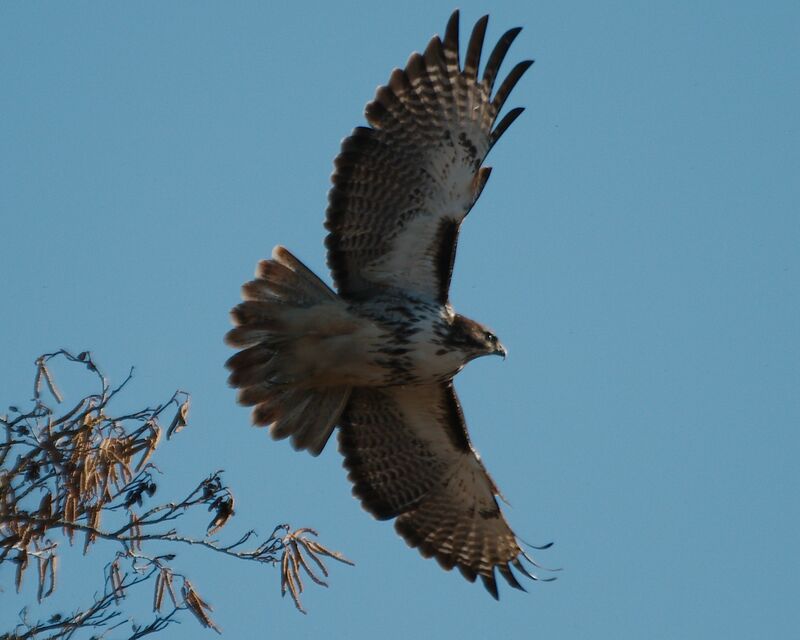 A Red-tailed Hawk called as it flew by. Everyone recognized its call as it is used for every raptor calling, regardless of species, in old Cowboy Movies. Then we saw two Ruby-crowned Kinglets flitting in the bushes. Our Guru Anne suggested that they might be Hutton’s Vireos which are very similar looking birds. The birds did not sing or call. Following a “cordial” discussion and intense ornithological examination, I confirmed, perhaps incorrectly, that they were Kinglets (Later confirmed to be Hutton’s Vireos, mea culpa). Continuing on, we saw a Bewick’s Wren and heard a very noisy Pacific Wren (we completed our 3 Wren day with lots of Marsh Wrens in, of course, the marshes of Reifel). We saw Anna’s Hummingbirds, Northern Flickers and Downy Woodpeckers, lots of Starling-like Red-winged Blackbirds, and many other regulars (Robins, Chickadees, Juncos, etc.). Mary heard Golden-crowned Kinglets. Pascale took the obligatory Group Photo (23) before we turned the loop to head back along the Fraser River side of the trail. Lots of buds coming out on the trees, a pleasant early Spring sight. 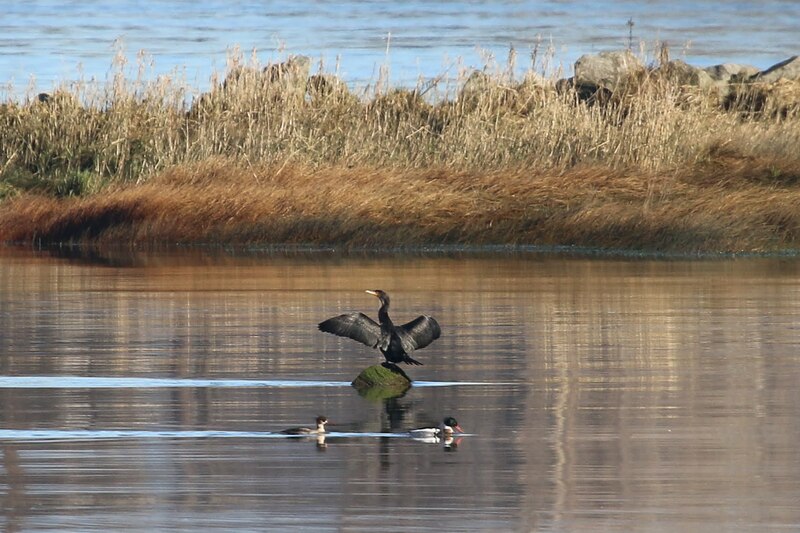 A “wing spread” Double-crested Cormorant posing on a small island was kind of neat. Bufflehead, Red-breasted Mergansers and Harbour Seals floated by. We checked out the Alaksen barn and found lots of pellets below the Barn Owl Nesting Box, but no Barn Owl seen today. We got back to the Alaksen Office late and drove to Reifel at about 10:30 a.m., as expected a half hour late. Realizing our time-challenged nature, Reifel arrivees Marion S, Mary Pat, Jonathan & Lorraine, and Pauline went ahead and we met up with them later. 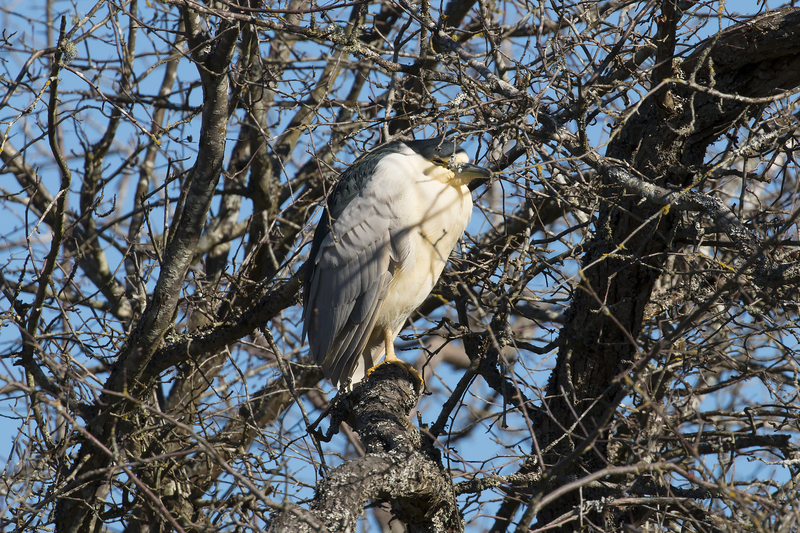 Near the entrance, we saw most of the five wintering resident adult and one juvenile Black-crowned Night Herons, with too many House Sparrows. Mary counted over 30 Great Blue Herons roosting around the first slough. A male Ring-necked Duck (we even saw the neck ring) was diving with Mallards, American Wigeon and gorgeous Wood Ducks near the fence. On the log were many Northern Shovelers and one male Common Goldeneye. We avoided feeding the begging Sandhill Cranes. We walked the west trail and saw lots of “little birds” including Towhees, House Finches, Song, Fox and Golden-crowned Sparrows, fed a Red-breasted Nuthatch, and of course, the Black-capped Chickadees (I didn’t see the Chestnut-backed). The blooming Daffodils all along the trail were a real treat to see. We didn’t see the Great Horned Owls (Later I saw the two “hopefully residing” GHO’s in my back yard). 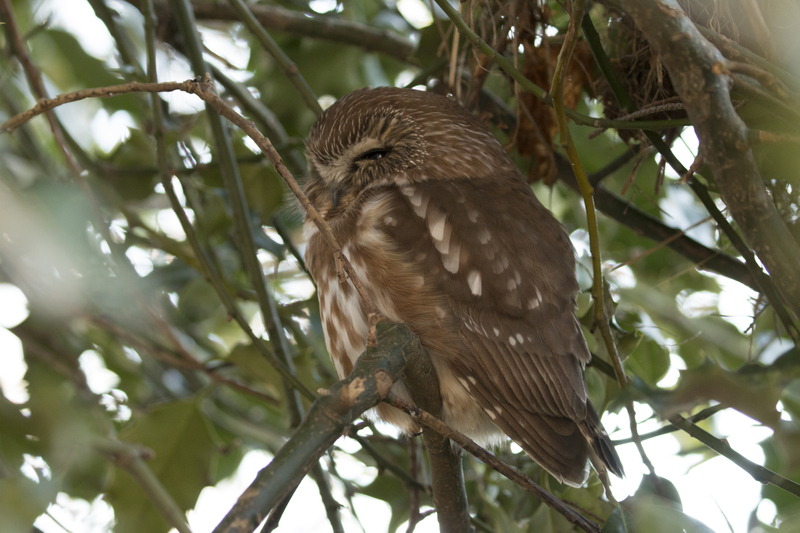 Thankfully, we found three Sawhet Owls which excited the Owl Lovers. I celebrated by eating one of PB Lorna’s delicious Muffins and Rob M’s Granola Bar. At the Tower, we heard a Virginia Rail but didn’t see one, nor a Sora. We didn’t see the Swamp Sparrow either which had been hanging around there earlier this Winter. Lots of Trumpeter Swans out in the marsh, with a few Snow Geese too, with many Gulls. We saw flocks of tiny Shorebirds along the shore, thinking Dunlin and Black-bellied Plovers; however, when aroused by flying Bald Eagles, they turned out to be Green-winged Teal. Identification by Size can be confusing when birding. Several Northern Harriers and a Red-tailed Hawk were also cruising over this outer marsh. Jonathan & Lorraine were ahead and called me about an American Bittern sighting. So we left the Tower and followed the Outer Trail to the Lookout. The Bittern wasn’t there but while I was being shown a video of it eating, it was seen down the path. It posed about five feet from us for a lengthy photo op before skulking off into the reeds. Our Bird of the Day, according to Roger M.
We continued our walk along the outer path, serenaded by Marsh Wrens. A Mink ran across the path in front of Anne and Mary. Then we spotted several Tree Swallows hawking insects above us. 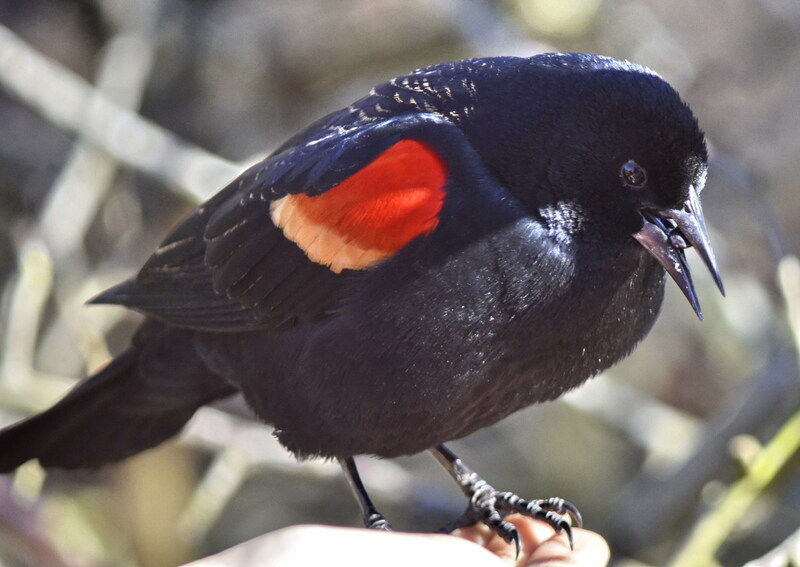 This sighting made us realize that it was time for us to clean and close our nearly 100 Delta Nats Bird Boxes at Boundary Bay, Kings Links GC, Earthwise and TsaTsu Shores to welcome these beautiful arriving migrants (Thursday, March 3 at BBRP). Heading back inland, the Lesser Scaup and Gadwall in this slough added to our count. Just after I nearly broke my neck slipping in the mud near the inner ponds (I love to grandstand), we fed a gorgeous array of mixed species, males and females in beaut plumage, right in front of us (Wood & Ring-necked Ducks, Lesser Scaup, Bufflehead, American Coots, Northern Shovelers, American Wigeon, Mallards). It was a fitting conclusion to an extremely enjoyable outing. Approaching 1:00 p.m., on Mike and Roger’s recommendation, several of us (David & Noreen, Jonathan & Lorraine, Roger M & Mike B, Anne M & Mary T, Chris McV and me) decided to have lunch at the Landing Pub on Ladner Trunk Road in Ladner. It was an excellent decision; the “VA VA Da Boom” Pizza Special was delicious, along with two Okanagan 1516 pints of beer. Next Tuesday, March 1, we will leave Petra’s at 8:00 a.m. for Queen Elizabeth Park in Vancouver. We expect to meet at the parking lot near the Mini-Golf Course entrance around 8:45 a.m. This entry was posted in *DNCB, Alaksen NWA, Bald Eagle, Black-bellied Plover, Black-crowned Night-Heron, Harbour Seal, Hutton's Vireo, Mink, Northern Harrier, Northern Saw-whet Owl, Red-breasted Merganser, Red-tailed Hawk, Reifel, Rough-legged Hawk, Sandhill Crane, Trumpeter Swan, Virginia Rail. Bookmark the permalink.